September is hare nd we are celebrating with spices, and flavors from around the eworld to create fresh tastes, rich music, and an experience you won't forget! Come, share the locally made Chocolate We have vast array of endorphin releasing creations - to tantalize your taste buds, excite your ears, Stimulation for your eyes as well... and of course your favorite flavors of Cacao, Hot Chocolate, and Freshly brewed Vanuatu Kava. Down home Psychedelic Funk... these guys will navigate your journey to the infinite mind with bossa nova colors, surging hard drive bass and psychedelic whispers caressing the edge of galaxies. 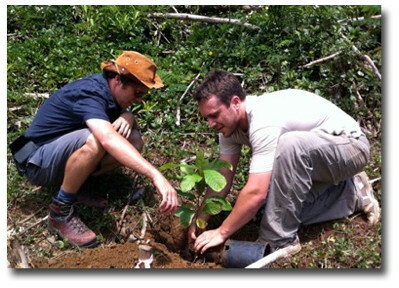 At Madre Chocolate, our quest to make truly amazing chocolate is driven by a passion to inspire greater appreciation among consumers for the rich cultural heritage and ecological diversity surrounding cacao. We aim for our selection of organic, fair trade chocolate bars to connect chocolate-eaters directly to the source, and in doing so to contribute to the well-being of cacao farmers and their communities. Our chocolate is carefully made bean-to-bar in Kailua, Oahu, Hawaii from lightly processed cacao that preserve many healthy antioxidants while still providing a rich, deep flavor you can enjoy while feeling good. In most other chocolate, fermenting and roasting the cacao destroys many of the antioxidants. We also use many high-antioxidant fruit and spice flavors that are traditional ingredients of the Aztec, Maya, and Olmec tribes that invented chocolate, to both preserve their cultural heritage and give you that original taste. 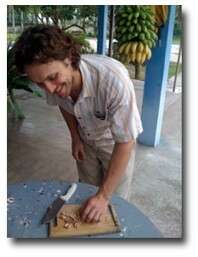 Dave is a bicontinental chocolate maker, avid traveller, and promoter of all things delicious. After working on rural development and environmental justice issues in cacao growing regions of Ecuador and Bolivia for many years, David was living half the year in the epicenter of chocolate in Mexico, Oaxaca City. He tasted many excellent, traditional drinking chocolates there, but couldn't find a fine eating chocolate that gave testimony to Mexico's long love story with cacao and he saw an opportunity. His excitement only grew when he saw the potential for a chocolate company with a social mission to make a positive impact on the lives of cacao farmers and their communities. 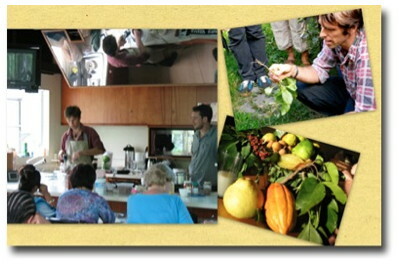 Dr. Nat Bletter has 15 years of experience in botany, documenting exotic fruits and vegetables, gathering food in the wild, herbal and traditional medicine, and exploring Asia, South America, Central America, and Africa. 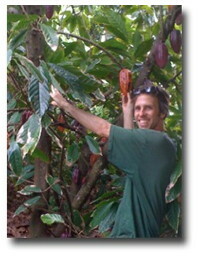 He has a Ph.D. in Ethnobotany from the City University of New York and New York Botanical Garden, where he researched medicinal plants of Peru, Mali, and the Guatemalan Mayans, ethnobotany, taste-modifying plants, and stimulant plants such as cacao, which has spurred him to start a traditional-ingredient, high-antioxidant, artisinal chocolate company Madre Chocolate. He will co-lead a culinary, medicinal plant, and music tour of Bali in August, where he has spent many months exploring the landscape, music, fruits, food and medicine since 1994. He now works at University of Hawai'i Manoa researching plants and migration in Thailand and Laos, and making chocolate from scratch. We purchase raw, fermented beans directly from farmers and cooperatives that we then roast and process in small batches to craft our chocolate bars. Fermentation is a vital step to bring out the complex chocolate flavors and fruity notes in the cacao bean. Getting well fermented beans is a huge challenge for farmers and chocolate-makers, because the the process has to occur within a couple weeks of picking the cacao, which is usually before the product is shipped off to another country for resale and then processing. The amazing thing about making chocolate in Hawai'i is that we can work closely with cacao farmers to dial in the fermentation and drying process for great tasting chocolate. 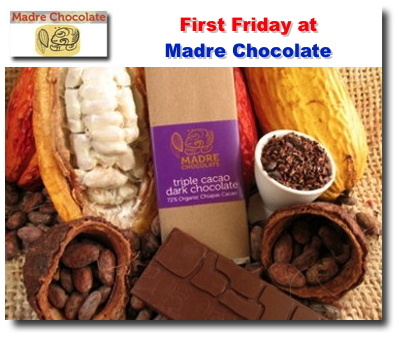 Many cacao farmers in the Latin America and Africa have never tasted the chocolate made with their beans. A couple of weeks after we get beans from a farmer, we're back at the farm tasting the chocolate and comparing notes on what we'd like to improve to really make their beans shine. Direct trade, where we get to know every farmer we buy cacao from, goes well beyond fair trade in that we see every farm we buy cacao farm, see the conditions of the people and the ecology on the farm, rather than going through a middle man with overhead costs. This way we can ensure that each and every cacao farm we work with are treating their land, plants, animals, and people well, and we can be confident that we are giving you truly sustainable chocolate that we see through every step of the process. 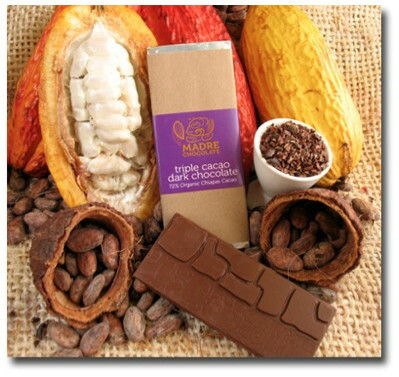 At Madre Chocolate, our quest to make truly amazing chocolate is driven by a passion to inspire greater appreciation among consumers for the rich cultural heritage and ecological diversity surrounding cacao. Saturday 11 am-6 pm, Sunday 10 am-6 pm. Please call 808-377-6440 if you have any questions.